Strapped to skis and pulled around a frozen lake by a thoroughbred racehorse -- skijöring is a sport like no other. The hardy skiers travel at frightening speeds, using just their voice and a set of reigns to guide the horses around the icy track. 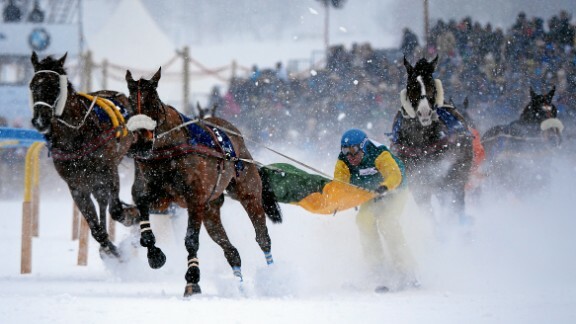 The unusual sport is considered the showpiece event of the White Turf races -- a wintery festival held at the upmarket ski resort of St. Moritz. The sport requires the ability to blend skiing aptitude with a high-level of horsemanship. "During the race you need a really strong voice," two-time race winner Valeria Holinger told CNN Sport. "Only by shouting can you make the horse go faster". "There is amazing speed and I love the adrenaline." Aspiring competitors must wait until they're 18 before being allowed to participate in the event. Even then, drivers -- as they're known -- must pass fitness tests and grueling theory exams -- for good reason, too. Not only are they traveling at incredible speeds, there is also the added danger of fully grown thoroughbreds trampling on the skis. In addition, the galloping hooves kick up huge amounts of snow and ice which crash into the legs of the skiers behind. "You have to be really brave," said Holinger, who became the first female winner of the race. "There is a lot of kick back from your own horse and a lot of speed." Such unique threats call for unique protection. Drivers are required to use face masks to keep the snow out of their eyes and wear body armor under their ski suits. Despite the obvious dangers, the truly unique event attracts thousands of spectators every year. "You definitely have to try it," Holinger said. Watch the video at the top of the page to see CNN's guide to skijöring.